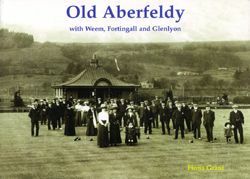 n the past, Aberfeldy has seen both Queen Victoria and the poet Robert Burns as tourists and it remains immensely popular with visitors today. This collection of photographs looks at the town in the early twentieth century when it still had its railway station, a cinema and horse-drawn coaches were provided to take passengers to the banks of Loch Tay. Also included are the villages of Weem, Fortingall and Glenlyon with additional photographs of some of the impressive country houses in the area and an interesting photograph of Dull.